Flash Recovery is a digital image recovery tool for flash cards. This utility efficiently restores deleted and corrupted files from formatted, damaged, unreadable or defective storage media devices. Undoubtedly, this program will be very useful for any owner of a digital camera, as the problem of accidentally or intentionally deleted pictures or video is familiar to any photographer. Moreover, the utility is a perfect tool for both amateur and professional photographers thanks to its simplicity and functionality. lost your weekend digital photos? recover your images with our photo recovery software! Flash Recovery will helps you to undelete images! photo camera or computer shutdown while writing flash card? bad blocks on the flash disk? Flash File Recovery is your Data Recovery Lab at home! try Flash File Recovery for free to recover your digital images and video! 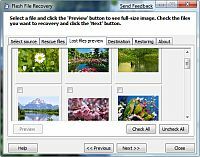 Flash File Recovery recovers image and video files of different formats: JPEG, TIFF and others; RAW Image files, like Canon CRW recovery, Nikon NEF, Kodak DCR and others and various video files - AVI, MOV, MPG/MPEG and many more. What is important, Flash File Recovery allows recovery of pictures from damaged or corrupted flash drives (including camera's built-in memory) and memory sticks. This fast and easy in use utility supports a wide range of flash cards: SmartMedia, Compact Flash, Memory Stick, MicroDrive, xD Picture Card, Flash Card, PC Card, Multimedia Card, Secure Digital Card, and others. The main benefits of Flash File Recovery are its total simplicity, ease of use and high performance at the same time. Obviously, the best thing about our flash card restore tool is that it is very simple and straightforward, applying "just press one button" approach to file recovery. It allows recovery of files with just a few clicks. Flash File Recovery has a wizard guiding the user with clear instructions, so even inexperienced people can easily restore files with it. Flash File Recovery supports Microsoft Windows 9x/NT/2000/2003/XP/Vista. Flash File Recovery is a data recovery tool for various flash cards (SmartMedia , Compact Flash, Memory Stick, MicroDrive, xD Picture Card Flash Card, PC Card, Multimedia Card, Secure Digital Card, etc) and digital camera memory. It can effectively recover corrupted or lost data from formatted, damaged, unreadable or defective storage media.